Spring has arrived! Beautiful daffodils burst into bloom on the first day of spring. How cool is that? 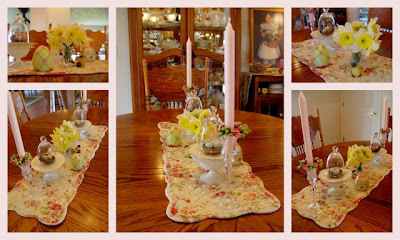 I couldn't resist bringing some inside to help with the ongoing evolution of the table centerpiece! Cheerful, yellow, fresh, and fragrant --- they anchored the centerpiece that was surrounded with colorful nests and eggs. By the way, Vee has caught the centerpiece bug. Visit her and see what is gracing her table today. I couldn't resist bringing in a few daffodils too.